Rachael Peckham speaks at Writer's Harvest. Over 100 people were in attendance during last nights opening literary speaking as part of the A.E. Stringer Visiting Writers Series. 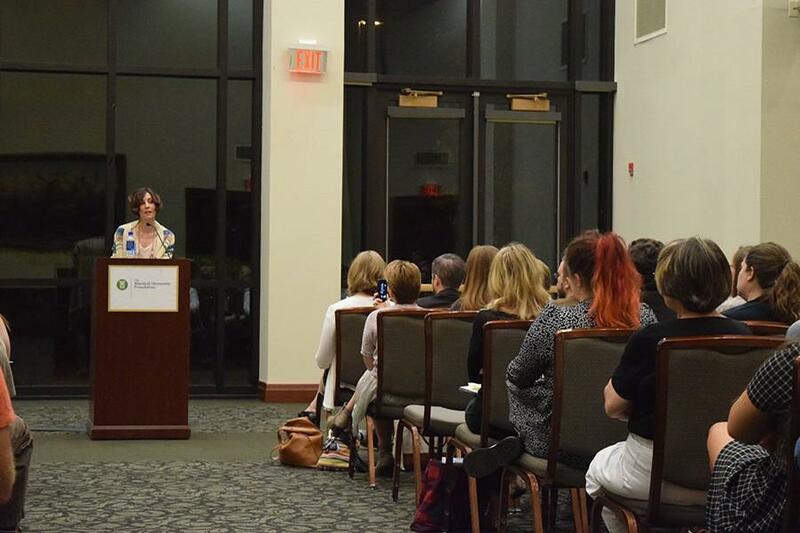 A crowd of students, faculty and Huntington residents gathered in the Marshall University Foundation Hall at 8 p.m. last night to listen to guest speakers Fajia Hassib and Rachael Peckham. The event is part of a national literary event to support local food banks, since Sept. is National Hunger Action Month. The event brought in a surprisingly large amount of canned goods, said Joe Vance, Operations Manager of the Marshall University bookstore, who said he has seen many food drives happen on campus. Rachael Peckham, a current associate professor of English at Marshall University, was the first speaker of the night, reciting seven of her personal prose poems. Peckham, a Midwestern native, holds a Ph.D. in creative writing from Ohio University and specializes in creative nonfiction. The poems focused on personal tragedies that happened in her life. Peckham was the opening speaker for Hassib and said she was ecstatic to be opening for her. Hassib was born and raised in Egypt and moved to the United States when she was 23 and is now a resident of Charleston, West Virginia. She is a Marshall alumni with an M.A. in creative writing. This wasn’t the first of literary events for many attendees including, sophomore Public Relations and Broadcast Journalism major, Rebecca Turnbull. The event was Turnbull’s fourth writers lecture who said her attendance to the events is to keep the art of writing in her life after changing her major from English, like her parents who are both English teachers. “Although I came for Rachael, I really liked the other speaker,” Turnbull said of Peckham and Hassib. Turnbull and friends each brought a number of canned goods to the event for donation to Facing Hunger Foodbank. Facing Hunger Foodbank serves 17 counties across West Virginia, Kentucky and Ohio. This event helps with the feeding of local community members across those areas.